TWO months since Townsville was devastated by floods, and after the television crews, Twitter hash-tags and international news media spotlight passed on, one thousand people were still homeless and thousands more still waiting to rebuild. 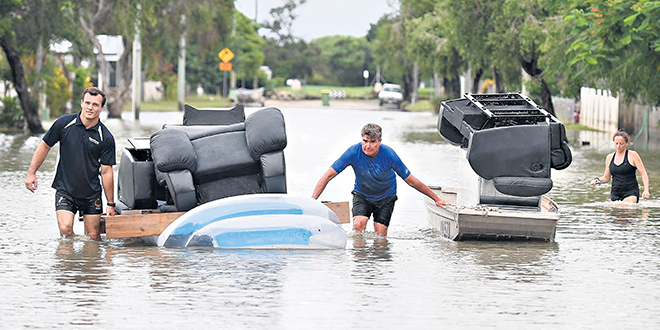 Townsville Bishop Tim Harris said the aftermath of the floods were still being felt and would be felt for some time yet. Bishop Harris said reports still had the number of homeless at about 1000 people. “The rental vacancies – you can’t find a place to rent,” he said. Bishop Harris (pictured) was among those waiting to rebuild, simply because there weren’t enough tradespeople for all the work. Businesses were doing it tough too, he said. “There’s 50 businesses in Townsville that are struggling to stay open,” Bishop Harris said. He also said the spread of infections and health challenges since the flood were concerning. Cases of melioidosis, gastro-intestinal infections, staph-like infections were among the outbreaks – Ross River Virus had also been reported. “That river (Ross River) has got a lot to answer for, it really has,” Bishop Harris said. After a recent trip to the mid-west, Bishop Harris said places like Julia Creek and Richmond were still recovering. While out there, he distributed some of the financial aid that was given to the diocese by the Brisbane archdiocese, other bishops, personal donors, congregations, and organisations. He also has been giving the money out locally in Townsville. He thanked the many donors who had given money to the diocese. “It gives you hope that people are rallying around you and supporting you any way they can,” he said. And for everyone doing it tough, he said there was hope just around the corner – Easter. Bishop Harris said all this suffering has been like a sort of death for the flood-ravaged people and that Easter was “literally hope on the horizon”. “Easter Sunday enables us to all cry out Alleluia from our hearts and from our circumstances wherever we are,” Bishop Harris said. “And when we’re able to do that, there’s that sense that all will be well. “Jesus has gone on ahead of us to show us the way; literally, out of our misery will come new life. “We will start again, this is not the end of the road for anybody. “With Christ on our side, how can there be a death that lasts forever? “Death doesn’t last forever, eternal life is the promise – death is destroyed. “All of that mess that these people have been in, and the terrible dislocation that has happened for individuals and families, they’ve lost a lot, but they’ve still got their lives and things can only get better – and things will get better.